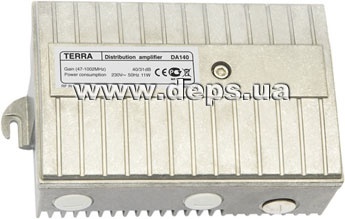 Backward channel amplifier is built in TERRA DA 140 and DA140D sub-base amplifiers. 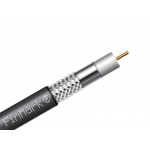 Built in diplexers and equalizer (line equalizer) provide flexibility of choice of backward channel frequency range (Upper backward channel frequency range is 200 MHz). Discrete regulators in direct and backward channel allow setting accurately the necessary effective gain level and amplitude-frequency characteristic tilt. 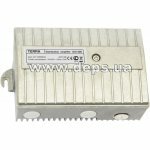 Amplifier adjustment can be done without interruption of subscribers’ service. 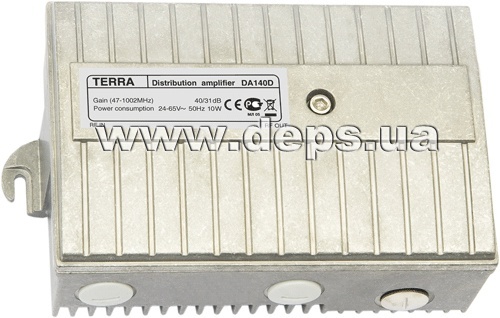 Sub-base amplifiers DA140 and DA140D can switch effective gain 40/31 dB in the direct channel and expand upper frequency range from 862 MHz up to 1002 MHz. Test points: at the input – two-directional, at the output - directional. 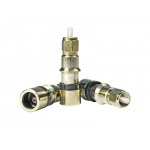 changeable backward channel band owing to built in diplexer modules. all adjustments are done without interruption of subscribers’ service. shifted direct channel frequency range 862 MHz or 1 GHz. switched direct channel gain 31 dB or 40 dB. backward channel frequency range up to 200 MHz (depending on built in modules). 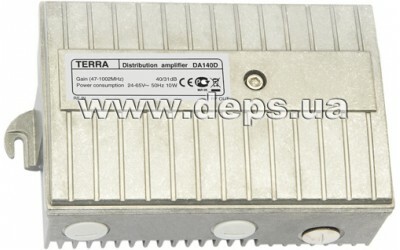 possibility of distant feed insertion into the line from the external power supply (DA140D). **** - Backward channel frequency range depends on built in diplexer; the upper vale is 200 MHz.